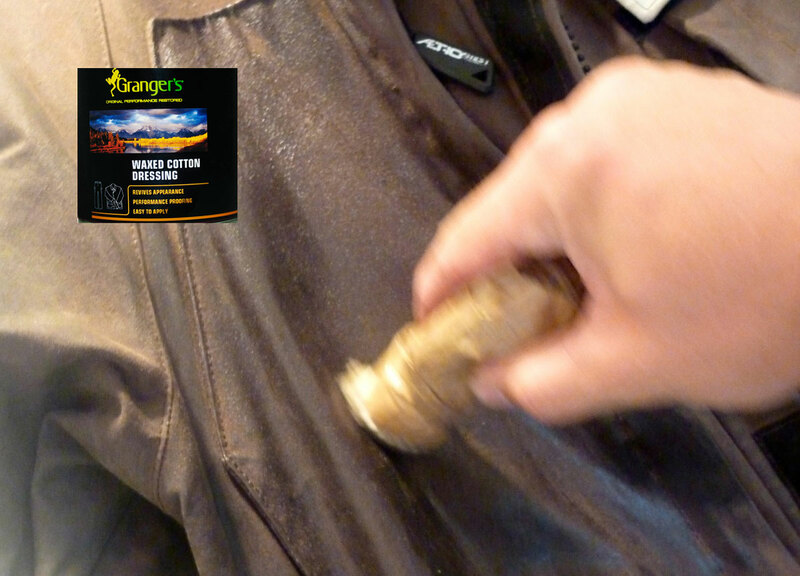 Chunky, well featured waxed cotton touring jacket, but fabric coating may not suit everyone and mine leaked through the arms. 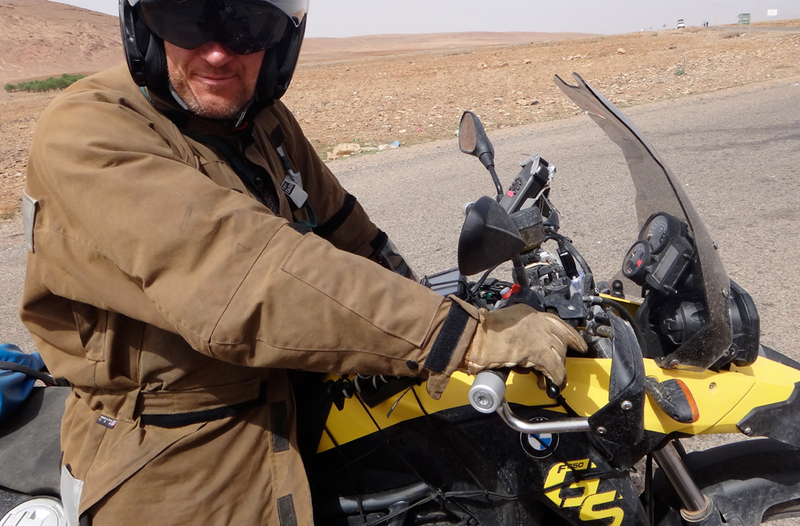 From new on a 4000-mile ride to Morocco and back across Spain in Spring 2012 riding a BMW F650GS SE. Worn around Britain since. Aerostich Falstaff page. Only sold in the US, as far as I know. This jacket was supplied free in return for Aerostich advertising in my books. The fittingly-named Falstaff evokes a solid British tradition and is Aerostich’s only waxed cotton jacket, cut to their classic Darien pattern in a dark tan waxed cotton. Inside is a tartan or plaid cotton lining that’s de rigeur with waxed leisure clothing. The Falstaff has under-arm and a back-width vents with water-resistant exterior pocket zips and pockets galore, large and small. I was still finding new pockets weeks after receiving it. I read that the Darien is a baggier and longer cut to Aero’s other popular suit, the shorter and closer fitting Roadcrafter which you commonly zip to Roadcfrafter pants. 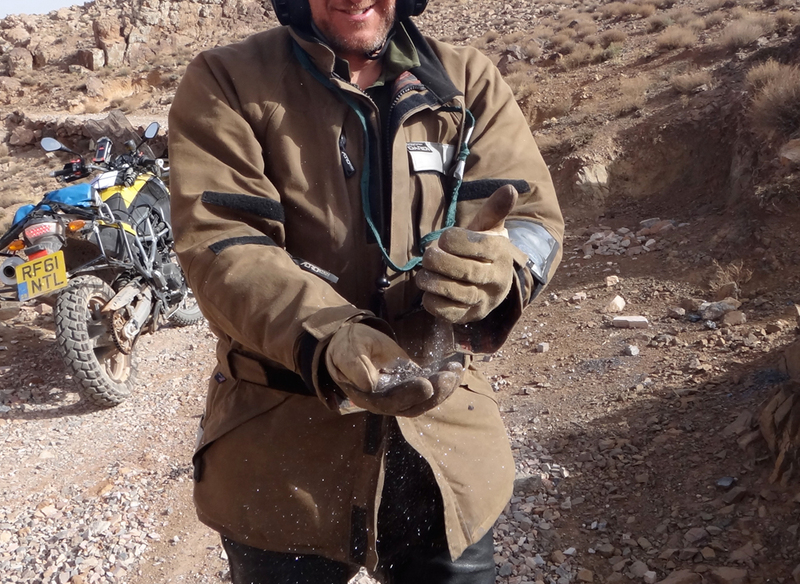 Like all Dariens there are elbow and shoulder pads and I was also sent a spine protector, but preferring a less bulky jacket, I didn’t take any of these pads on my ride to Morocco. There are four 3M reflective patches too, though you can specify ‘no reflection’ for a subtler appearance. (I read that France now requires riders to have a certain area of reflectiveness on their clothing – hopefully no more than a typical ‘Stich jacket). In fact with Aerostich you can specify any mod you like – with a few clearly labelled exceptions it’s all made in Duluth, MN and they’re happy to oblige. Great customer service plus the cool catalogue is one of Aero’s hallmarks. The size I have is large which weighs about 2.3 kilos or just over 5lbs without the padding. Though I read complaints in reviews about short arms, they were just fine on me. The Falstaff replaced my 9-year old Aerostich Darien Light. There was nothing wrong with my little-used DL, but I fancied a change and wanted to see what was new and so gave it away a an auction for the Ted Simon Foundation. On the big night my DL scored the second highest bid just behind Ted’s famous Jupiter’s Travels open face helmet. Before the Darien Light I also owned a Darien which is identical but made from a heavier Cordura fabric. I used that in BC on a very rainy ride, but found it a bit too stiff (they say they do give over time). Scanning the web for a replacement in the understated and functional Darien style was much less successful than expected. Obviously there’s plenty of cheap stuff out there, but also too much over-designed or over-priced gear for my taste or wallet. And then there’s this new trend for separate breathable liners that you wear if it’s raining/cold, or not if it’s warm. That means the outer jacket gets soaked or ‘wetted-out’ in rain which makes the inner liner’s job of breathing through it all the more difficult. 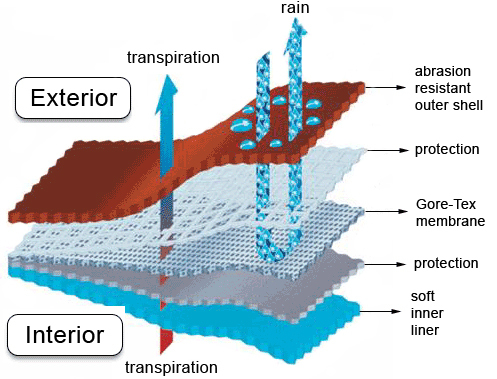 As it is, I suggest in the new AMH that I doubt membrane type clothing works that well when applied to relatively passive motorcycling; sitting still in the rain at 70mph is less effective in getting the membrane working than hiking up a hill which produces sufficient energy to purge the built-up moisture as the active body generates heat. I suspect this separate breathable liners trend is nothing more than a cost saving measure that’s being sold as a ‘have your cake and eat it’ option, but I’m happy to be corrected on that. Anyway, after an afternoon’s browsing, on looks alone I think I was heading towards a Dainese Evo or whatever cropped up used in my size on ebay when Aero offered another Darien. I like to keep trying new stuff as it’s good for the book so after some discussion we settled on a Falstaff – an ‘organic’ Darien. So you know, the Falstaff and other gear I get from Aero is a contra deal in return for an advert in my AM Handbook and associated titles. Having worn waxed cotton Belstaff clothing back in the 1970s and avoided it since, I was a bit ambivalent about going down that road again with the Falstaff but hoped things may have changed. My recollection was a robust-feeling material (compared to a regular nylon Belstaff of the era), but with a messy coating that left indoor smears on my mum’s prize-winning wallpaper, felt unpleasant to touch and was not so snug in the cold. This was all just before the Cordura + Goretex revolution in moto clothing. Out of the box the Falstaff looked great – I like that tan deserty colour, what a shame it’s now mostly gone under an oily brown patina. The fit too was just right for me once the TF3 pads warmed up. 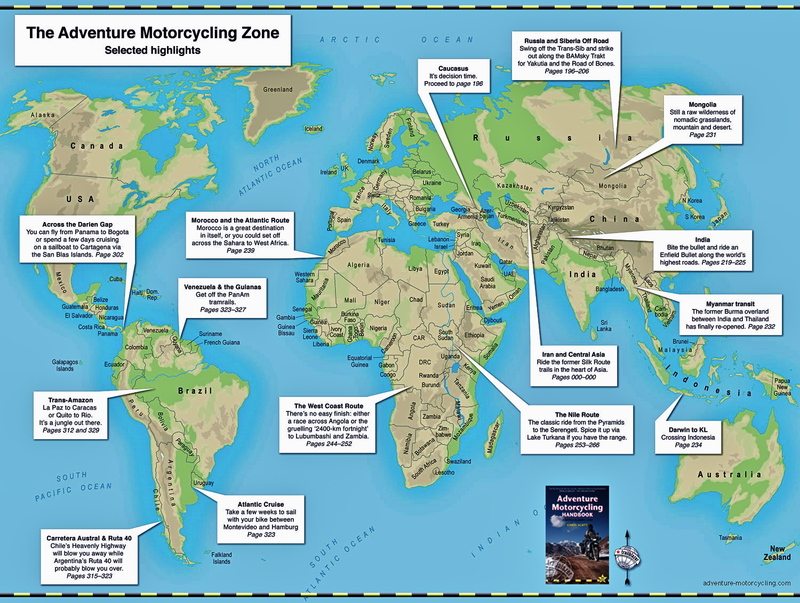 A functional touring jacket has to be at the core of your overlanding gear; a place to stash stuff and feel protected from the elements and possible crashes. On my ride the temperatures ranged from 1°C with snow flurries while crossing the High Atlas, to about 30°C (86°F) on the hotter days down on the Sahara’s edge; days which also coincided with slow riding and pushing the bike through the sands. I also wore heavy leather trousers, and under the Falstaff either the electric Kanetsu liner over a thick shirt, or just the shirt. Above all I love the array of pockets – no less than a dozen, but you don’t have to use them all. I don’t like to wear daypacks or use a tank bag and so my jacket becomes a kind of ‘ditch bag’ containing everything I think I need or can’t afford to lose. It’s all there in the pockets at hand’s reach, not in a backpack that needs talking off, or a tank bag that needs removing when you’re stray from the bike. I especially like the big ‘Napolean’ pockets inside and out, and just as I was thinking of getting a pocket sewn into the back lining to carry my iPad while away from hotel rooms, I realised there was a huge net pocket inside the back vent which could take a 17-inch MacBook Pro if need be. It’s an Aerostich, I should have known they’d not waste that opportunity! (In fact it mentions that pocket on the website, so RTFM). As expected, the strong initial whiff of wax or paraffin lessened after a few weeks in Morocco, though it took a good few months to go away. It’s just about gone now but if it smelled of warm leather there’d be no complaints here! In Morocco I was deliberately wearing only a shirt plus my Aero Kanetsu electric liner to put it all to the test, and never got chilled except when I got in a muddle with the Kanestu’s switches. Even then I do wonder if a Kanetsu is essential with a chunky Falstaff. Depends where you live and when you ride of course, but if your bike can’t handle the output I suspect a thick fleece and a Merino under layer would still keep you warm – the waxed cotton feels very wind-proof, even if in itself it can’t be described as a cozy garment. One piste I did in Morocco was a hot day which ended up with a lot paddling and pushing the GS through soft sand. At this time the Falstaff was just too hot and all the vents in all the world, including the front zipped down made little difference with a hot backwind and speeds of less than 10mph. I ended that afternoon with the liner soaked and evaporated sweat encrusted as salt on my shirt. I have to say it would probably have been the same with any jacket, but I have a feeling my nylon Darien Light might have been less sweaty or maybe just less heavy. The Falstaff can feel as hot as a leather jacket. As I neared my destination that evening and got onto easier terrain, I undid the front zip completely and let the jacket flap around and air itself out. By the time I got to my lodgings it and I were almost dry. 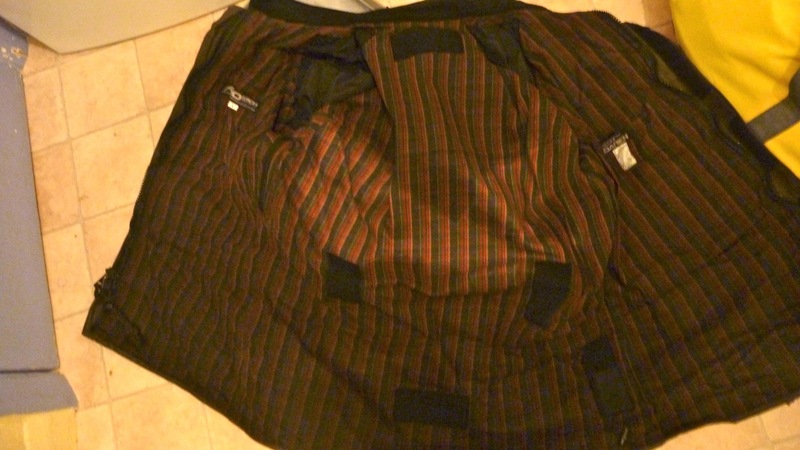 I do wonder though if something different – more modern dare I say – could line the jacket interior instead of cotton plaid and if, as the blog guy suggests below, it might even be removable for washing, so you don’t get bogged down in washing the whole garment. As it is waxed cotton doesn’t seem to be washable with any detergent, all you can do is wipe it down with a sponge which won’t shift road grime. Something wickable maybe? Cotton is notorious for sapping away body heat when wet and had I had a long ride in colder temps following that sweaty afternoon I might have got really quite chilled. Of course powering up the Kanetsu electric vest would have seen to that. All of which makes me wonder, does waxed cotton breathe? Intuitively I’d say no and if it does then it’s at the cost of waterproofedness, but Aero and this googled blog post (worth reading, plus his half-dozen follow-up posts) suggests it does a bit, while the chat here says not really. If it does breathe then I’d say not as much as Goretex in optimum conditions and circumstances, but a lot better than a PVC bin bag sealed up with duct tape. I must admit I never felt sweaty on the ride as I’d have done in an impermeable PVC mac, so perhaps it breathes better than I think. Knowing what wax is, I find it hard to see how while retaining waterproof qualities, unless the wax-impregnated cotton fibres swell when wet (like cotton tents supposedly do) to seal against rain, then as it dries a little porosity returns. Interestingly, I’ve also learned that ‘oilskins’ is another name for waxed cotton. Like the blogger, part of my rationale in thinking the Falstaff was a good choice was that unlike GoreTex, wax cotton can be reproofed indefinitely, just like an old pair of leather boots. (Have you tried getting a pair of non-membrane hiking footwear lately, btw? – near impossible). Goretex might work well when it’s new, clean and undamaged, but as far as I know we’re talking about a cling-film-like miracle pore layer bonded onto the inside of the jacket onto which is bonded a permeable inner liner, more or less (left). Although in the middle of a sandwich, once that film gets damaged or the nylon either side gets clogged with body oils or grime, it will let in water for good and/or it won’t breathe like it did. Goretex seems a short-term solution but you still have to marvel in how WL Gore have managed to so dominate the market in ‘waterproof’ leisure wear, although work wear, I’m no so sure. There must be something to it but I do remember thinking when it came out in the late 70s that the whole ‘condensation vapour out / no water in’ malarkey sounded a little far-fetched and I think the same now. 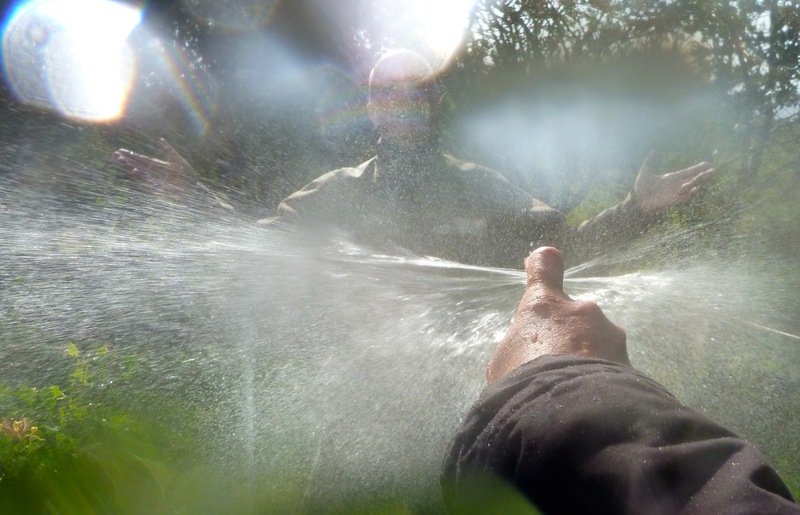 I really wasn’t keen on buying another expensive GTX jacket, even an Aerostich, that would require washing in special soaps and curing with DWR (surface water repellent) only to know the ‘magic film’ would eventually fail. This is a jacket that I like to think I’ll be wearing on a long trans-continental trip, not a touring holiday. The infinite reproofability of the Falstaff was an attraction and as the chat site above notes, it’s tough (maybe no more so than a 500-weight Darien; Aero say it’s a bit less abrasion proof) but also immune to melt holes from campfire sparks. In Morocco there were a few showers. Unlike Cordura once it’s lost it’s DWR treatment, water rolls off the waxy Falstaff as off a duck’s back. There seems little possibility of the fabric letting any rain through (but see below), but of course on any garment the stitching is the weak point. I know Aero’s synthetic clothing is finely sealed with taped seams, but I’m not sure how the Falstaff’s panels are joined together and sealed. Maybe the wax impregnation takes care of it. It was on a long day across Spain that I had a chance to put the Falstaff to the rainproof test. Several short spells of heavy rain had no effect but a huge deluge let rip by early evening at which time both lightning and a rainbow where arcing across the stormy sky simultaneously. 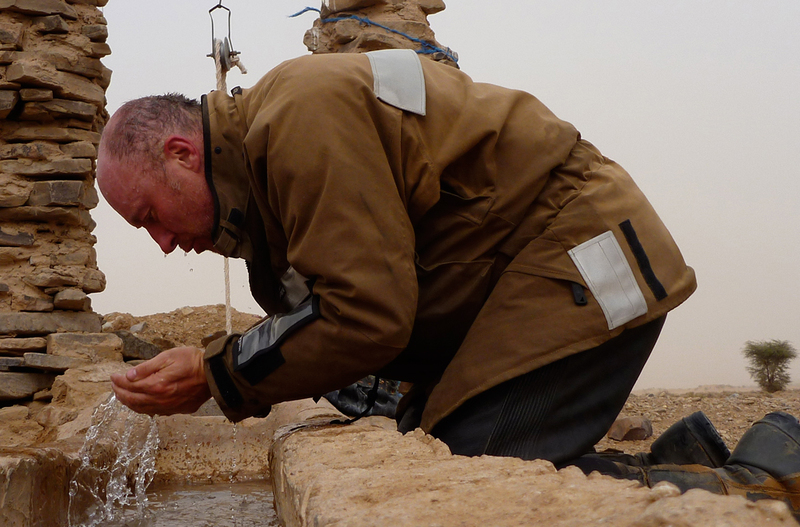 I turned off into some town to pull on the €3 waterproof leggings I’d bought in Fez (my ageing Darien pants got stolen on the Morocco ferry – I’ll miss those). By the time I turned the bike around the roads were ankle-deep in run-off and commuters were inching through the flood. Back on the motorway the rains pelted against the screen which admittedly largely protected the front of the jacket, but after maybe half an hour I felt the tell-tale twinge of wetness at the more exposed right elbow. My theory is that the rain leaked through the sewn-on velcro straps (right) which cinch in the sleeves to stop them flapping, hold the elbow pad in place or to reduce the air gap to keep you warmer. Many bike jackets seem to have this feature now. Without cutting the lining open it’s hard to tell if the velcro seams are glued and taped from behind. It doesn’t feel like it and on the inside of waxed cotton that would be tricky anyway. But if that’s a weak spot it’s surprising Aero didn’t think of it or owner reviews mention it. In summary, my reticence with the Falstaff is the same as with any waxed garment, the ‘ickyness’ of the weatherproof coating. It’s something you only notice when putting it on, using the pockets or walking around, but you wouldn’t want to slump onto your mother-in-law’s albino calfskin sofa in it. Like leather it certainly steadily acquires characterful creases, unlike a nylon Darien or any other synthetic moto jacket. Six months from originally writing this, I have to say the Falstaff hasn’t grown on me. I don’t particularly relish putting it on as I do with favourite clothing, because of the feel and appearance of the waxed cotton; that stuff won’t wash off with soap. The jacket now looks like I’ve used it to make several messy oil changes under a car. Waxheads know it’s just the polished wax coating, but some civilians will just perceive you as another grubby biker. Then there was the annoyance of popping a car satnav into one of the outer chest pockets during a downpour – it never recovered. The pocket was wet inside; now I know I should have used an inside pocket, but as you’ll see below, even that is not immune. I’ve since performed a EU-accredited suction test: clamping your mouth around a bit of fabric and sucking. On a plastic bag – full seal of course, no breathing possible; on unpolished parts of the Falstaff like the back, slow suction possible, but slightly more than on my near-new breathable Rab Bergen Event™ jacket. On the grubbier, patina’d front pocket of the Falstaff, notably more suction possible – the fabric here is more breathable and so less waterproof than other sections. Perhaps it all just needs a light reproof on the shiny sections followed by a hair dry, as this article recommends. I’ve since carefully reproofed the pockets on one side of the front with Granger’s Waxed Cotton Dressing which as expected failed to resort the Aero’s original sandy colour – in fact it’s gone quite dark and shiny, but at least dried to a less waxy mess than I anticipated. 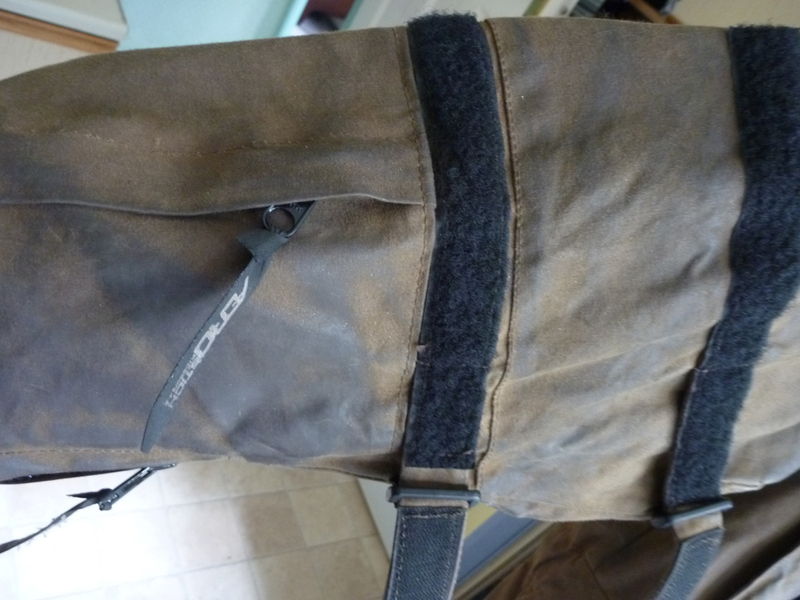 It certainly doesn’t look as good and smart as when it was new, but I got the g-friend to give me a damn good hosing (left) and the re-waxed outside pocket was dry inside, the patina’d one on the other side damp. 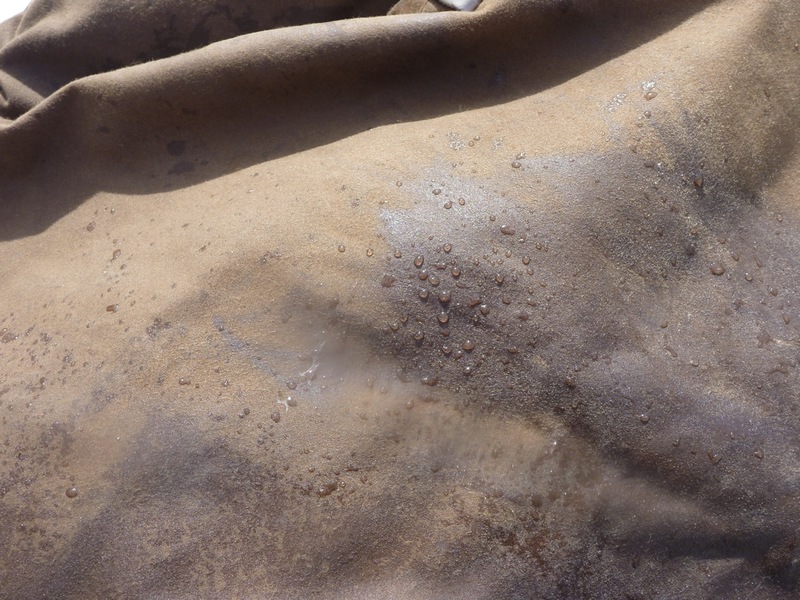 And on the shoulder where I reproofed a bit, the droplets clearly pool on the wax while they get absorbed into the original, unpolished matt, tan section. So reproofing looks like it works but will re-patina and in my opinion ruin the jacket’s original appearance. In a couple of weeks I’ll be riding back south to London during which time I’m bound to get rained on. 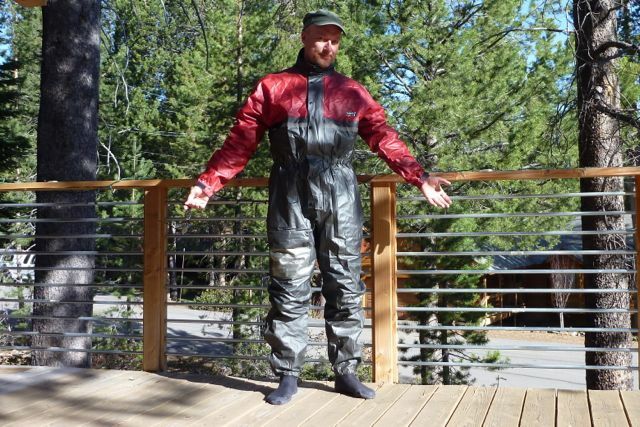 More news then but as I’ve written elsewhere, to keep dry from all-day rain, whatever you wear, get an impermeable one-piece riding suit in coated nylon or better still, PVC, like the old style Rukka (left). I got rained on. At the end of a cold, 450-mile day, for two hours on the motorway and another two across town the skies let go. I pulled on my Rukka one-piece over my legs which stayed as dry as, same as my boots which I waxed months ago. But within an hour I could feel wet arms, as in Spain months earlier. And when I got back home I found the entire lining of the jacket was wet apart from a small patch in the middle of the back (right). The inside pocket was wet with my phone and wallet – one place you hope to be dry. My thick merino cardigan was damp but kept the wet off my trunk, but the arms were soaked right through. Exterior pockets that I had judiciously wax-proofed a fortnight earlier also had wet contents, maybe through the zip. The jacket took a day or more to dry. Imagine being mid-trip and having to put on a sodden Falstaff for another long day at <6–9°C. It’s possible that seepage through the jacket’s leaking arms may have spread right across the lining, but whatever the reason, it was soaked inside. Not good. 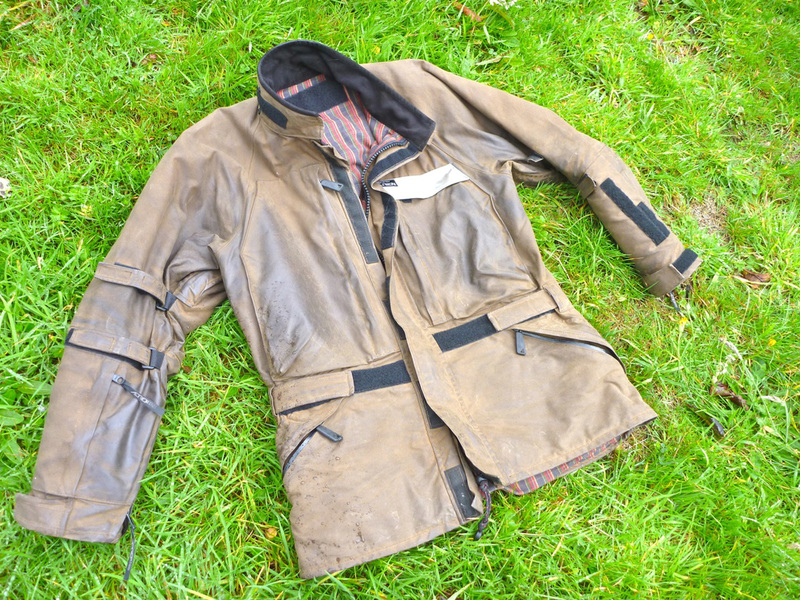 I’m informed the similar £500 Belstaff Trailmaster comes with a ‘waterproof seam-sealed jacket in light coated nylon‘ … and in the US this Melville wax jacket from Rev’It comes with a removable Hydratex waterproof membrane liner. I believe ‘oilskins’ must work on a certain level but there’s a message in there somewhere. This entry was posted in Adventure Motorcycling Gear Reviews, AMH News, Jackets & Trousers and tagged adventure motorcycling jacket reviews, Aerostich, Aerostich Falstaff jacket, Aerostich Kanetsu AirVantage electric liner, Belstaff Trailmaster, does gore tex work, does waxed cotton breathe, rab bergen, Rev'It Melville, Ted Simon Foundation. Bookmark the permalink. I was just about to write down some musings on ‘Gore Tex’ branding and how it’s synonymous with ‘100% waterproof’ and then I found this article. Totally agree. Me too. To paraphrase the Baudelaire /The Usual Suspects “The greatest trick Gore-tex ever pulled was convincing the world their wonder fabric does what it claims”. The decision rests with two factors: how much you want to look the part and, more pragmatically, how cold it will be. If its very cold then I wouldn’t go PVC as a membrane (even if overhyped) will give you a better chance of wearing some warm kit underneath without condensation worries.